The United States and individual European nations are among those keeping information close to their chest, partly for fear of revealing strategic or military secrets, ESA Director of Operations Rolf Densing told AFP at the International Paris Air Show. "Right now, we do have about 750,000 pieces bigger than one centimetre (0.4 inches)" in orbit," he said. Many were caused by explosions of abandoned satellites and rocket bodies. The number could grow to about 1.2 million by 2030. There are also "several big, uncontrollable spacecraft"—including thousands of non-responsive satellites left behind in space. This, mingled with an estimated 1,500 operational craft in orbit—including the manned International Space Station—makes for a hairy situation. "The highest risk are big, uncooperative objects" over which ground crews have no control, said Densing. "You can imagine if they hit each other, or if they hit the space debris, break up further, this will cause an avalanche effect." Yet, knowledge about space debris is similarly "scattered"—held by national space agencies and often furnished only when a collision threatens their own space assets, said Densing. The US is believed to hold the most complete catalogue, listing an estimated 20,000 pieces of junk, he said, and Europe—both ESA and its individual members—fewer than 10,000. ESA contributing states withhold certain debris data even from one another, and from the 22-member agency, said Densing, who also heads the European Space Operations Centre in Darmstadt, Germany. The only information needed is when, and where, a piece of debris will find itself in the orbital region, he explained. No need to divulge trade or military secrets—and "this is not what we're asking for". But there is a fear, he said, that "if you look for space debris, inevitably you will find things that nobody wants you to find." 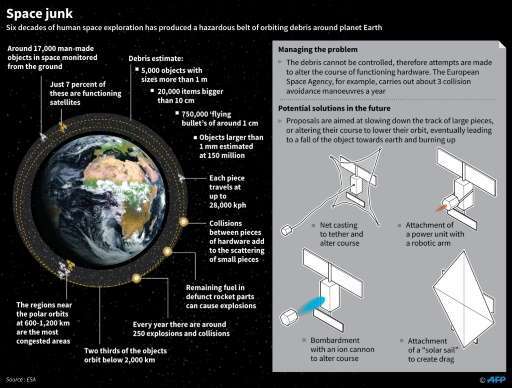 Having a global, open database on space debris would allow experts to compile collision warnings and give spacecraft time to take evasive action. "What I am advocating... is that we all overcome our vanities, we all open our catalogues," he said. "This is about protecting our orbits, and it's in the interests in everybody." A "snowball effect" of debris crashing with debris to create more and more pieces of dangerous junk, is already underway. In 2009, two satellites—Kosmos and Iridium—collided at a speed of some 11.7 kilometres (7.3 miles) per second, destroying both and creating a debris "cloud" around Earth. This "cloud", in turn, is thought to have yielded a small particle that smashed into Europe's Sentinel 1 satellite in August last year, knocking seven "splinters"—yet more of debris—off a solar panel. "I am not sure that the problem is fully understood," Densing lamented. "Those that have the most satellites, it's those that probably have contributed on a bigger scale to space debris, and I think also are the same ones that could profit the most if we avoid future collisions." In recent years, spacefaring nations have adopted guidelines which determine that every spacecraft must be moved out of harm's way within 25 years of ending its life. Bubba - balloons operate well below the orbit of even the lowest satellites. Also, the cost of deploying enough balloons to affect global warming would be enormous - the resources to build and float them would also increase global warming. There are few satellites that are not in either the JSpOC catalog or the ISON catalog, the real problem is that there are a number of satellites that are of the type that have exploded before. And there are satellites such as ENVISAT that failed before it could be passivated. We need to go up and address the problem of a few known satelllites.